Open your mind. Relax your brain muscles. This will take a little creativity. Rewind to the 1968. 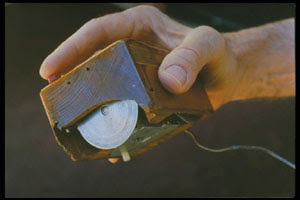 Douglas Engelbart is about to put on The Mother of All Demos (MOAD). 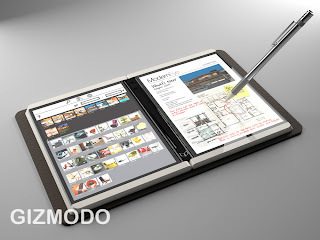 This time, though, instead of inventing and demoing the first computer mouse, he invents a touch (or even multi-touch) screen and shows off an interface that has more in common with Surface or iPhone than Windows or OS X.
Pretend that mice were never invented. What would today's computer interfaces look like with 41 years of research and evolution and industry focus on multi-touch interfaces? Recently, there have been several articles that show touch in a negative light, with conclusions like these: "Touch is Dead On Arrival" and "[multi-touch] adds little of value." Those types of comments come about because when some people think of touch on a PC, they visualize a GUI (mouse + keyboard) application and then add some touch to it, and see that touch is redundant or unnecessary. Well of course it is! I agree! Who would want to use an application or OS designed for a mouse pointer with +- 5 pixel precision with their fat fingers with +- 30 pixel precision? In our imagined alternate MOAD touch demo world, though, every application would be designed to work well with gestures, multi-touch, and fluid, high-frequency touch interaction. I'm proposing the MOADtouch project: Let's help people imagine what a NUI world would look like. Take your favorite GUI application, throw out the GUI, and totally reinvent it as a NUI. Pretend touch was only acceptable input device to the mass market. Forget the Windows, Icons, Menus, Pointers. Forget the rectangles. Start with your finger tips and design out from there. I want everyone to participate, regardless of individual skills. Write blogs, create wireframes, mock up screenshots, mock up videos or even code up prototype interactions. Describe or show the experience. Do not throw out any possible application just because someone else doesn't think it would work with touch. Recreate the interface so that it does work. I want this to be viral. Send this to all your friends and colleagues. Get them all to create and post something simple, even a snippet of an idea. "It'd be cool if XYZ was like this: ..." Twitter it. Blog it. Flickr it. Remember: Open your mind. Relax your brain muscles. This will take a little creativity.